JEFFERSON CITY, Tenn. (April 14, 2019) – Pro Andrew Upshaw of Tulsa, Oklahoma, won the FLW Tour at the Cherokee Lake presented by Lowrance after catching five bass Sunday weighing 15 pounds, 6 ounces. Upshaw’s four-day cumulative total of 20 bass weighing 67 pounds, 10 ounces, was enough to edge second-place pro Grae Buck of Harleysville, Pennsylvania, by 1 pound, 2 ounces, at the event that featured 164 of the world’s top bass anglers. 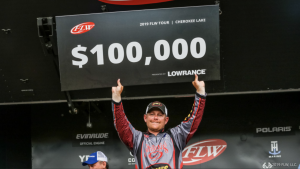 For his win – the first of his FLW Tour career – Upshaw earned $100,000. FLW is the world’s largest tournament-fishing organization, providing anglers of all skill levels the opportunity to compete for millions in prize money in 2019 across five tournament circuits. Headquartered in Benton, Kentucky, with offices in Minneapolis, FLW and their partners conduct more than 290 bass-fishing tournaments annually around the world, including the United States, Canada, China, Italy, South Korea, Mexico, Portugal, South Africa and Spain. FLW tournament fishing can be seen on the Emmy-nominated “FLW” television show while FLW Bass Fishing magazine delivers cutting-edge tips from top pros. 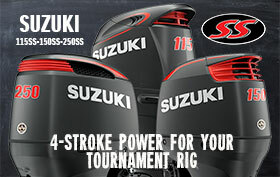 For more information visit FLWFishing.com and follow FLW at Facebook, Twitter, Instagram and YouTube.